The SLR is done for 2011. With many marathons and half marathons in the record books, we have a few more to go: Beth will be heading to the Cape while Haecha heads to Dublin to finish up the October marathons, Diana has Philly in November, and Tom has his in December… the rest of us, however, are on easy street for a while. What better way to celebrate that than a big BRUNCH!!! Sunday, November 6 will be the fall 2011 SLR Brunch. It will be hosted once again by Michele D’Angelo, who lives in Stoneham (She’ll post where exactly). For those who want to run, we can meet at 8AM, do some miles, and then head over that way around 9:30 or 10:00. This brunch is a pot luck. Michele will be supplying the house, we supply the goodies… and I’m not talking Gu and Fruit Slices! Post here if you’re coming and what you plan to bring so we don’t have 20 dozen Brueggers Bagels. See you all on November 6th! 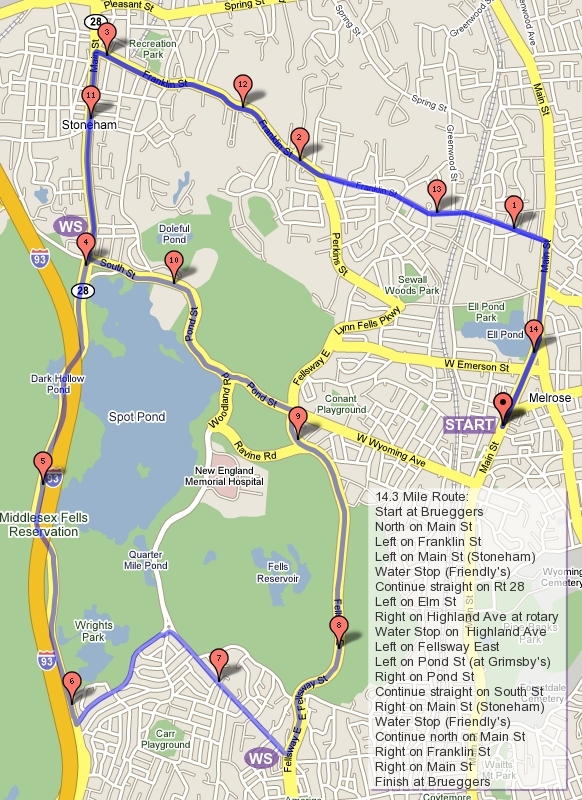 This week is the final run of the Fall 2011 Sunday Long Run Marathon Training Season. This week we’ll give people a bit of a break. Although the plan is to run the Melrose Half Route, some of us are nursing injuries that hills will just irritate further. In the spirit of not doing anything stupid right before a marathon, instead of that route we’ll be running a nice, flat 10.7 mile route up to Lake Quannapowitt and back, and people can add some Melrose back roads to tailor the distance to something a little longer if they feel like it. To handle this route I need just one water stop volunteer. I think BrianW is on board but Â keep your eyes on this blog if you might be able to step in if needed. Hope to see you all tomorrow, 8AM, Brueggers for one last hot long run. Who’s in? ROLL CALL!